Smile! It’s Dental Assistant Recognition Week! As we kick start the week, lets take a moment to recognize why a dental assistant is so important to a dental office. They are dedicated employees whose work can easily go unnoticed. But today, we want to take a minute to give all of these dental assistants the recognition they deserve. You probably have not given much thought to what a dental assistant does. They actually play a pretty big role when it comes to patient care in a dental office. They come in frequent contact with you and are a friendly, familiar face. They will take your x-rays, impressions and assist the doctor with any procedures. In fact, they were part of your care before you even walked into the door. They made sure that all of the instruments and supplies used during your appointment were clean, sanitized, and ready to go. Dental assistants are a valuable asset to a dentist. He relies on them to help provide quality dental health care to his patients. They use their skills and knowledge to assist with procedures. They have gone through extensive training and are good at what they do. They are also friendly and compassionate people. They do everything they can to help enhance their patients satisfaction. So as we start off this dental assistant recognition week, we want to say a big thank you. Thank you to all of the dental assistants out there for the hard work and continual effort they put forth. They are the smiling faces that make our trip to the dental office more enjoyable. We appreciate you, dental assistants! 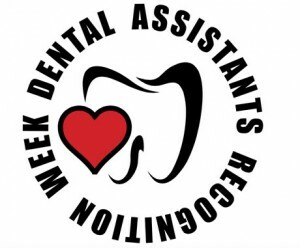 Dental Assistant Recognition Week is sponsored by the American Dental Assistants Association, the American Dental Association and is recognized by the American Institute of Dental Assisting.